The pectoralis major (L. pectus, chest ; major, larger.) is a large, fan-shaped chest muscle. It acts on the shoulder and (indirectly on) the scapula, with its most prominent role being the prime mover in shoulder horizontal adduction. The pec major is the largest and most superficial of the anterior axioappendicular muscles, lying superficial to the entire pectoralis minor and subclavius, and part of the serratus anterior. 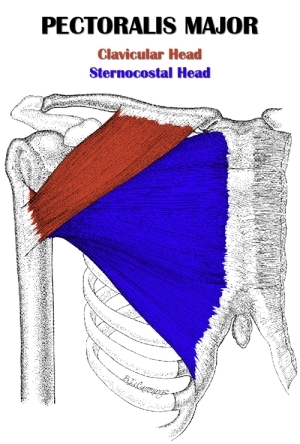 The muscle consists of two heads: the clavicular head, or upper chest fibers; and the sternocostal (sternal) head, or lower chest fibers, which makes up the vast majority of the chest mass. The clavicular fibers run inferolaterally from their origin on the inner clavicle, while the sternal fibers run laterally and superolaterally from their origins on the sternum and ribs. The parallel-oriented fibers of each head converge as they insert on the proximal humerus, giving the pec major its fan-like or radiate muscle architecture. 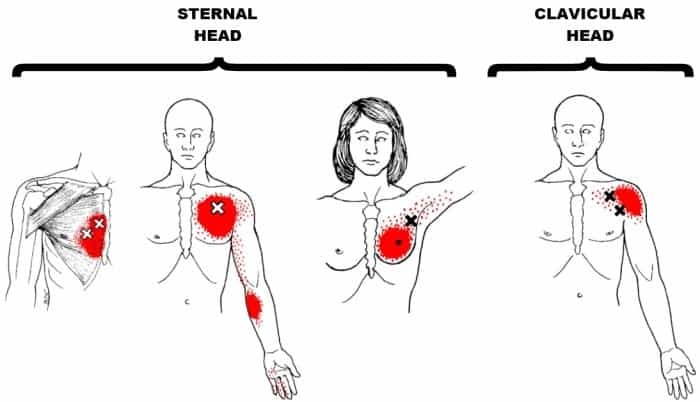 Note: All the exercises below work both the clavicular and sternal head. However, the incline exercise variations emphasize the clavicular head more, whereas the decline variations emphasize the sternal head. The flat variations work both heads more evenly compared to incline and decline variations, though there’s still a slight emphasis on the sternal head. If an exercise doesn’t have any asterisks next to it and if it doesn’t have “incline” or “decline” in its name, then it mimics a flat chest exercise. Overactive/Short Pectoralis Major: The pec major is overactive and short in people with upper crossed syndrome (UCS). The shoulder internal rotation and scapular protraction associated with UCS facilitates the pectoralis major, which in turn reciprocally inhibits the shoulder external rotators (rear delt, infraspinatus/teres minor) and the scapular retractors (mid traps and rhomboids). The pectoralis major may initially become short and overactive from emphasizing chest training more than back training, and from slouching throughout the day. The tighter the pecs become, the more the upper back rounds and the shoulders and head come forward. This limits thoracic extension, scapular stability and overhead shoulder mobility, which commonly leads to rotator cuff injuries and neck pain. Reduce your chest training volume significantly (e.g. if you’re currently doing 10 sets of chest per week, start doing 6 instead). Do pectoralis major stretch and release techniques daily, and as part of your warm up for any workout with upper body exercises. Do the same for the pec minor, since it is likely to be at least as tight as the pec major. Increase your training volume on rhomboid and middle trapezius exercises to strengthen your scapular retractors. Do at least twice as many sets per week as you do for chest training. Also, the lower traps are also very likely weak and lengthened, so add in a few sets of direct lower trapezius exercises. Train all these muscles 2-3 times per week. Increase your training volume on rear delt exercises by doing twice as many sets for rear delt exercises as you do for chest exercises. Spread your rear delt training over 2-3 workouts each week. Do few sets of an infraspinatus/teres minor exercise such as dumbbell external rotations with light weight and high reps, three times per week. It may also be beneficial to do a few sets of internal rotations for the subscapularis, since it may become synergistically inhibited by the overactive pec major. Avoid or reduce the time you spend in a hunched-over posture (e.g. reduce time spent on laptop or smartphone, if possible, and sit up straight when using them). If you have upper crossed syndrome, you’ll need to do more than what’s outlined above. See how to fix upper crossed syndrome (article coming soon) for full details. Intermediate and advanced lifters should train chest twice a week. This is often best accomplished by doing an upper/lower split. You can focus on strength (i.e. heavy weight, low reps) during one workout, and hypertrophy (i.e. moderate weight, moderate reps) on the other. Or you can integrate both strength and hypertrophy into both workouts. Beginners should be on a 3 day per week full body routine, and should be focused on increasing strength on big compounds – not worrying about building a bigger chest. Choose one heavy compound movement (e.g. any barbell bench press variation). Then choose 1 to 4 other chest exercises to more directly target the chest (e.g. any non-barbell press; any fly, chest dip or push up variation). In reality, one additional chest exercises is plenty to train your chest with sufficient volume and to hit it from multiple angles. The only reason to do more exercises would be to introduce variety and make your workouts more fun. Use full range of motion on the negative rep to get a full stretch in your chest (note: if you have shoulder issues, see the next bullet). On the positive rep, you should lockout when training your main strength lift (e.g. bench press); you can stop just short of lockout when doing accessory/hypertrophy exercises (e.g. dumbbell incline bench, machine chest press, chest dip) to keep tension on the chest throughout the lift. Keep your elbows tucked in on pressing movements. While flaring your elbows out may target your chest more, it can limit range of motion and will eventually lead to shoulder problems in the majority of people. Plus, you can lift much heavier weight with your elbows in. Full range of motion is always preferred, if possible. However, on some exercises – most notably the barbell incline bench press – it’s acceptable to stop a couple inches above your chest at the bottom of the rep, assuming you have good form and that going all the way down causes pain. This way, you avoid putting excessive strain on the shoulder joint. Alternatively, you could use dumbbells, which allow you to go deeper because you can change your wrist and elbow position during the movement to avoid shoulder strain. Avoid the chest dip (and any variations) if you already have shoulder issues, And be very careful with it if your shoulders are healthy. This exercise involves bringing the upper arm beyond the back, or shoulder hyperextension. This is a vulnerable position for your shoulder joint, particularly under a load. That said, the chest dip is a highly effective movement for building up the pecs when done correctly: Use a moderate weight that you can do at least 6-8 reps with, and make sure your elbows never go below 90° at the bottom of the rep. If you’ve only been lifting seriously for 1-2 years, chances are your entire chest is underdeveloped. When you have a relatively small chest, the lower fibers will be the first to visually show development because they make up the majority of the chest. However, as you continue to gain overall muscle mass, the upper fibers will become more and more visible. Do you have poor upper body posture, where you hunch over with your shoulders rolled forward? If so, this will make your upper chest appear smaller than it actually is. What happens is your shoulders “collapse” in and forward, which makes your upper chest look hollow. Stand in front of a mirror in your default, hunched posture to see what I’m talking about. Then pull your shoulder blades back and down, and you’ll see that your upper chest becomes fuller and your entire chest appears wider. To fix your posture permanently, see upper crossed syndrome (article coming soon). Dedicate about half of your chest training to one or more movements that emphasize the clavicular head (i.e. any incline chest exercise). I personally like to keep flat bench as my main lift, and for accessory work, I do a few sets of dumbbell incline bench press or cable incline fly at a low incline of 15-30°. 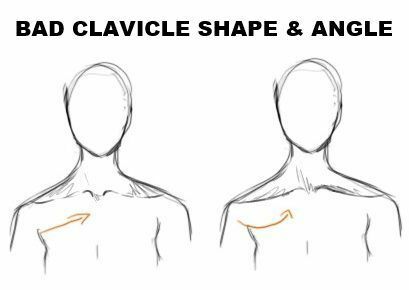 The length, shape and angle of the clavicle – when viewed from the front – are the most important genetic factors determining upper chest aesthetics. First off, it’s desirable for the clavicles to be long, as this gives a broad chest/shoulder look. For shape, it’s most desirable for the clavicles to be straight (rather than curved). You want the want have either a slight upward angle (i.e. higher at shoulder than at sternum) or a horizontal angle. 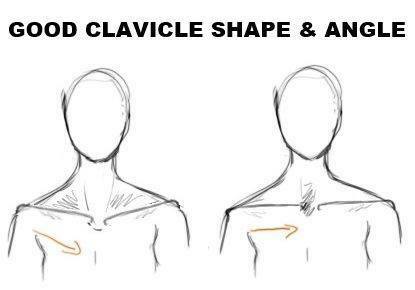 These are the optimal clavicle shape and angles for a good upper chest shape (i.e. straight; angled slightly up or horizontal). Sub-optimal clavicle shapes/angles can be seen in this picture. Similarly, genetics also impact the lower chest shape. The best lower chest aesthetics are seen on guys with a minimal gap between the lower/inner border of the two pecs. 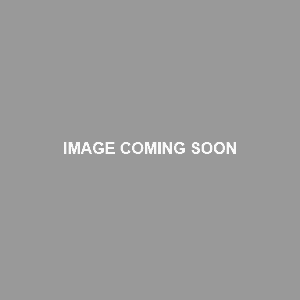 This depends on the structure or position of the sternum, ribs and external oblique aponeurosis, and where exactly the muscle attaches to them. Don’t sweat it if you have “bad” lower chest genetics. As you can see from the pics on the left, it’s still possible to build an excellent physique despite having sub-optimal sternal head origin attachments. Related: Although there is an upper and lower chest, there is no “inner” or “outer” chest, despite many people believing in such. Hi! Im wondering if I have good chest genetics. 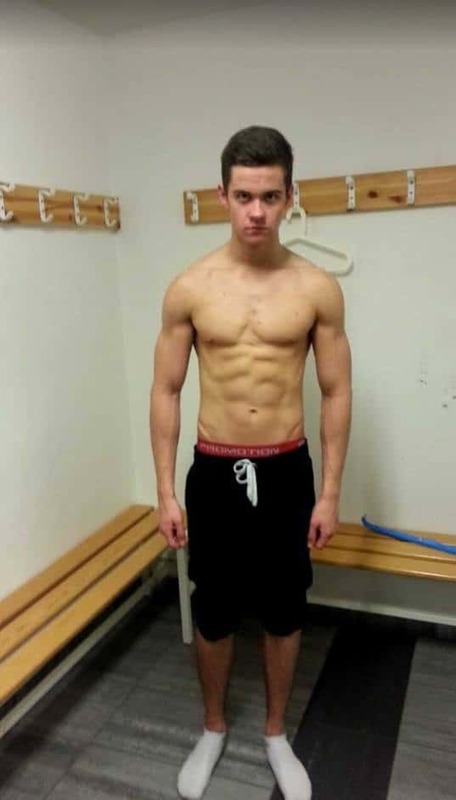 In my own opinion I look like Dexter J but I am so small so its very visable, I dont really know and Iam really concernd about this because I want to be a very succsessful mens physique competitor.